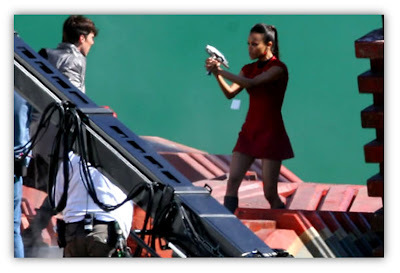 MarketSaw - 3D Movies, Gaming and Technology: MUST SEE: Set Photos From STAR TREK 2! Quinto And Saldana Vs. Cumberbatch!! 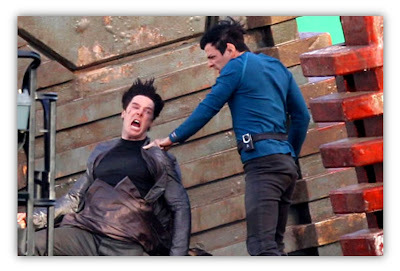 MUST SEE: Set Photos From STAR TREK 2! Quinto And Saldana Vs. Cumberbatch!! FINALLY we see something cool from the set of JJ Abrams STAR TREK 2! A couple of interesting photos to say the least. First up we have Spock (Zachary Quinto) applying his Vulcan nerve pinch to Benedict Cumberbatch's villain role (of which we still don't know his official name). However it seems Cumberbatch is somehow able to avoid the grip somehow as he seems quite conscious and looking to counter! MTV reports (don't laugh, but they called this maneuver the Vulcan Death Grip which obviously has never existed) that the two are fighting aboard a "space barge set". Let's hope it's not a garbage scow for the sake of James Doohan's character! Speculation that Cumberbatch was actually part of Starfleet before his turn to villainy? Many think his shirt hints at that. Further we have Uhura (Zoe Saldana) drawing iron against Cumberbatch in the second photo. MTV says she does so to save Spock's life. The standard large green screen looms behind. Seems this villain is a busy dude. I just hope I don't keep seeing Sherlock Holmes every time he's on the screen (he nails that role if you haven't seen the BBC series yet). So all in all some very exciting photos to be digested here! What do you make of the scenes? STAR TREK 2 is being converted to 3D and is slated for a May 17, 2013 opening.